"We were always under the assumption that the brain doesn't change very much after childhood," explains Sarah-Jayne Blakemore, a professor of cognitive neuroscience at University College London. But that's simply not the case, she says, and educators — and teens themselves — can learn a lot from this. Blakemore has a new book, Inventing Ourselves, The Secret Life of the Teenage Brain — where she dives into the research and the science — and offers insights into how young adults are thinking, problem-solving and learning. Our conversation has been edited for length and clarity. 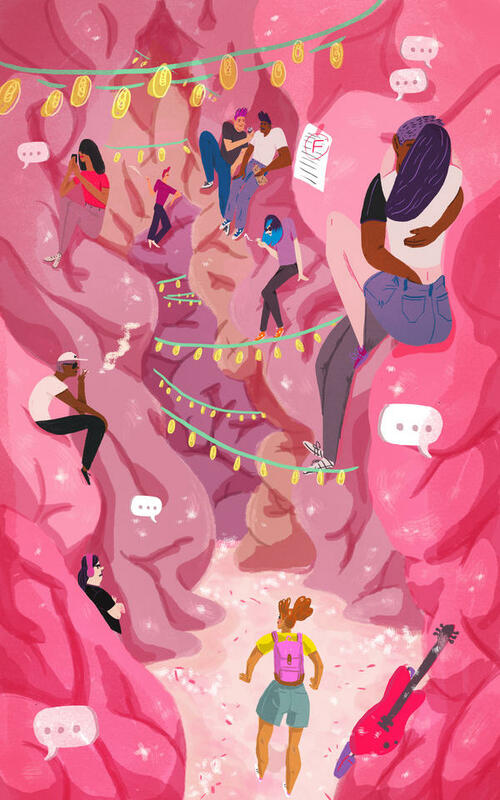 Understanding the teenage brain can be really useful in an educational context. What are some things you've learned that educators should know? Sleep. The fact that the circadian rhythm matters. That the body clock changes at puberty. There's a kind of shift in the body clock by about two hours during the teenage years, meaning that teenagers feel sleepy a couple of hours later at night than adults. They, therefore, feel very tired in the morning, much more than they did as children or than they will feel as adults. That has implications for school start times, because school starts very early in the morning. Schools normally start about 8:30 a.m. or earlier — and that, for a teenager, is arguably in the middle of their night. From a biological point of view, they should still be asleep. Of course, this is really tricky because the whole of society revolves around young people being at school during the working day and parents are reluctant to leave their children at home while they go to work. So it's very difficult from a societal/policy point of view to implement this change. But a few schools are playing with start times and trying to monitor the results to see if later school start times improve educational outcomes and social-emotional outcomes. You also suggest that teenagers themselves should be learning about the science happening in their brains. I think that understanding the teen brain should be part of the education curriculum for teenagers. They should learn about their own brains and how they're changing because I think it's empowering for young people to know and understand more about why they might be feeling a certain way. They should understand why they might be particularly self-conscious or susceptible to peer-influence, or more likely to take risks. The teenage years are a really important time in terms of vulnerability to mental illnesses. We know that most mental illnesses first appear during adolescence; at some point before the age of 24. It's important for teens to understand the biological reasons and the social reasons why that might be, in terms of trying to cope with different feelings and possibly mental health problems. So brains are continuing to develop into the mid-20s. Does that mean that learning is easier during this period than adulthood? What's the relationship between development and plasticity? So the brain is undergoing huge amounts of change in adolescence, both in terms of its structure — the composition, the amount of grey and white matter — and also in terms of how it functions: How it activates when you do different things. Now the interesting thing about that is, what does it mean for brain plasticity and learning? And there's a general assumption based on a lot of research that this development that we see during the adolescent years, means that the brain is particularly plastic — at least in some brain regions. The brain is particularly influenced by the environment during the teenage years and might be particularly amenable to learning certain skills. It's a sensitive period for social information, meaning that the brain is set up during adolescence to understand other people and to find out about other people's minds, their emotions. Brains at this time are good at understanding social hierarchies. So peers and friends are really important during this time. Friends take on an extra step in terms of their importance and the role they play in adolescents' lives. Adolescents do have an increased propensity to be influenced by their friends, particularly in areas like risk-taking. Things like smoking or drinking or experimenting with drugs, those are risks that they tend not to take when they're on their own. I think particularly the fear of being excluded by the peer group is a big driver of adolescent typical behavior. Can schools use those social motivators to help students learn or to stop bullying, or increase awareness about health issues? There's a model in public health. There's been research showing [that], if you educate the well-connected young people in the class about the negative effects of bullying and social exclusion and then you motivate them and incentivize them to run a kind of anti-bullying campaign, that leads to hugely reduced incidents of bullying and social exclusion. It also leads to changes in attitudes towards bullying and social exclusion across the whole year group over the following year. That's exactly what young people care about. They care about what their friends think and the social norms. So trying to change attitudes and behaviors around people maybe around risk-taking or bullying should focus on judging. And teachers can use that model, too. How does social media influence all this? It really matters to teenagers to be included by their social group, by their friends, and so they're more likely to go along with what their friends think. Social media like Instagram or Snapchat or Facebook or whatever it might be, allows teenagers to exercise their desire to make social contact all the time. They never get away from it, even in the middle of the night. There's not very much research on how social media affects the developing brain, but one area that I'm pretty convinced by is the effect on sleep. A lot of young people who I work with, they will have their phones on all night. They won't turn them off. They won't put them on silent and they even respond to messages that come in throughout the night. That surely affects sleep and we all know that sleep is so critical for mental health and learning. What's the next thing you want to investigate? I'm really interested in individual differences. Everyone's brains during the teenage years develop slightly differently. And the question is, why? Why do some people's brains develop a little bit more quickly than other people's? Is it something to do with their genetics or their environment, or their socio-economic group or their culture? Maybe even things like their nutrition levels and how much exercise they do. "How do all these environmental factors influence brain development?" is a question that I'm really interested in, as are many other labs around the world.